"Choose your body, Adapt new parts, Battle to the death!" A.D.A.P.T. is a uniquely themed mashup style card-&-dice game. 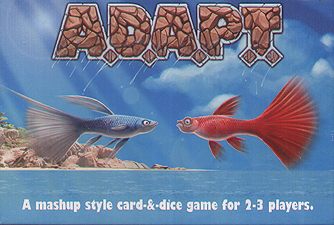 Each player chooses a Guppy, forcibly Adapts new Bodies and Parts, then fights to become the last Masterfish in the sea! With all players sharing the same deck, and every card in that deck being unique, you'll not only be adapting your fish but also your strategy! Will your bioelectric flying dolphin win out over the amphibious great white with an enhanced brain? ...or will the poisonous armoured orca rule the sea?